← Cartridge World Bloomingdale/Wheaton/Downers Grove Asks: Is Your Business Focus Getting Blurry? It’s never been easier to recycle and get rewarded for it! Local schools and community organizations can reap the benefit in dollars! 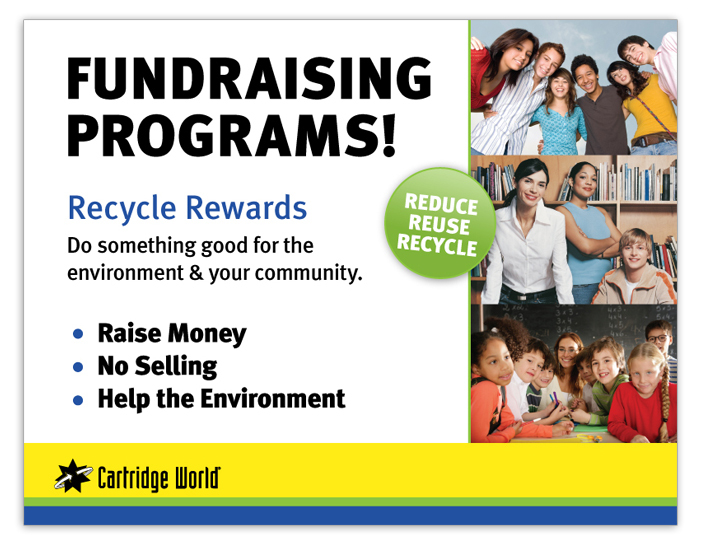 Cartridge World is committed to reusing, recycling while helping both our Earth and our local communities. We encourage community organizations and schools to get involved at the local level by collecting empty ink and toner cartridges, bringing them to us (or having us pick them up), so that they can be recycled or remanufactured . For that effort, Cartridge World will simply write the school or community organization a check. School programs are constantly being cut or reduced. Counteracting this trend is as easy as implementing fundraising campaigns that work. The more empty toner or ink cartridges your school collects, the larger the check. Get parents involved and encourage them to talk to their friends, neighbors and relatives. Community organizations can benefit just as easily. Register your school or community organization with us. We will give you promotional material for you to advertise the fundraising program. Let us know if we can provide you with a collection receptacle you can display at your location. When full, we will pick it up. If it works better for you, bring your collected ink and toner cartridges to one of our locations. Word of mouth is powerful! By making friends, neighbors and relatives aware of your fundraising program, all they have to do is come in into one of our stores and just mention the school or community organization for you to get credit. Needless to say, in addition to benefiting from the fundraiser and helping save our Earth by recycling, everyone can save up to 50% on remanufactured cartridges. It’s what at Cartridge World we call a Win-Win-Win Situation! Call us to set up your school or community organization! This entry was posted in Fundraisers and tagged Bloomingdale, Cartridge World, cartridges, community, Donwers Grove, ink, local, Organizations, programs, raise money, Recycle, recycling programs, Schools, toner, Wheaton. Bookmark the permalink.